"After we found the Comfort Zone Camp, our purpose for running came full circle for us. " Earlier in life, we encountered tragic events that resulted in the loss of a parent and sibling. We are sadly familiar with the array of emotions that come along with experiencing such a loss. Although it has been years since their deaths, we still feel heartache every day. Losing a parent as an adult is difficult. As a child and young adult, it is unimaginable. At any age, you need support. Running is a gift that has changed our lives. Running makes us feel powerful. Through Teacher2Mother2Runner, we want to provide encouragement to other women who are runners. Together we build a support system that will never be broken. After we found the Comfort Zone Camp, running all came full circle for us. There are many children and young adults that lose parents and siblings and need help handling how their lives will be forever changed. Teacher2Mother2Runner will be able to not only provide our team members with opportunities to live healthy and happy lives, but will also be able to donate to this wonderful camp as well. 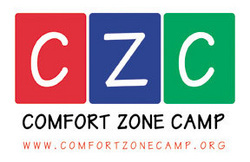 Help us raise money for Comfort Zone Camp now!